Dan Young, author of many fine cookbooks, and a true food lover, has a great site called youngandfoodish.com. 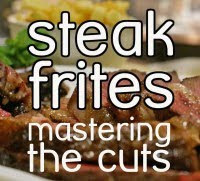 One of his current articles is about steak and frites… I have yet to meet a meat-eater who does not enjoy steack-frites, as the classic is commonly called (and misspelled) in France. Young is wild about the dish, and has tracked it from prehistory into the future. Don’t miss this article.